Hawkins Theatre presents a dynamic schedule of events from live performance events to music, theatre, dance and more. It also hosts regular screenings of films with a particular focus on New Zealand, overseas festival and 'arthouse' films. 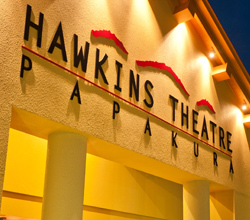 Visit www.hawkinstheatre.co.nz for tickets or the Hawkins Theatre Box Office (Monday to Friday 9am to 5pm).